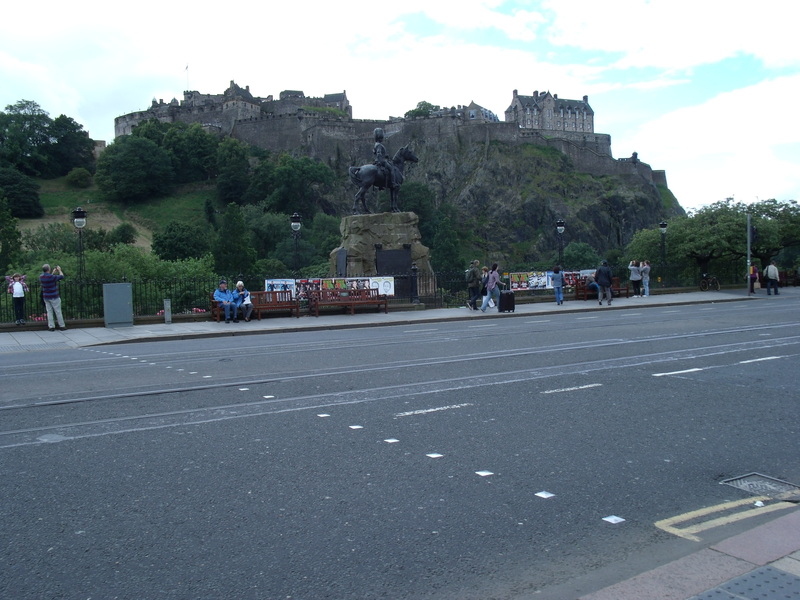 This past weekend I went to the Royal Edinburgh Military Tattoo which is staged in the courtyard of Edinburgh Castle. Unfortunately, for a number of reasons, I didn’t get the photos and videos I had hoped for. However, those I did get will give people who have never attended the Tattoo a hint of what all the fuss is about worldwide. For those who have been, it will take you back to the moment. The first video is so short as to be almost useless. I open with it because it gives a brief glimpse of the torchlit castle archway and ramparts on which I should have been concentrating more. The video following this snippet does more justice to the spectacle. This year, the Tattoo had a decidedly naval flavour. The next video shows the Dutch Navy Cycle Band. As well as wearing drab green and performing on cycles, the band also has dress uniforms and plays more serious music. They joined the many pipe bands, including the Ghurkas, and the Royal Marine Band for the finale. The Brazilian Navy Band also took part. I stopped filming before realising there was more to come. The next really short video shows the medics rescuing the bike rather than the rider. I’ll post one more piping video from the Tattoo before looking at some of the sights and sounds around Edinburgh. At the foot of the rock into which the castle is built there is a depression that is now parkland. At one time, this was a loch that served as an added fortification for the citadel. It was drained when the New Town was built. The castle and the adjoining streets going off The Royal Mile make up the Old Town. The Scott Monument, erected for Sir Walter Scott, is the largest monument in the world to honour a writer. It is situated just yards from Waverley Bridge and Waverley Railway Station, named after his novel, ‘Waverley’. The white, marble statue of Scott sits under the arches of the pseudo Gothic structure, dwarfed by the soaring spire. When built, the stone was made to look black and weathered to give the appearance of antiquity. The pristine white marble statue stands out in stark contrast but can only be seen from certain angles, often hidden by the arch supports. This piper at the corner of Waverley Bridge and Princes Street gives a fitting Scottish greeting to travelers pouring out of the station. The coffee shop patrons across the road can sit outside and be entertained while taking five. The white, marble statue of Sir Walter can be seen in the background under the arch. The monument and gardens behind the piper mark the beginning of New Town. Waverley Bridge joins the Old Town to the New Town. This view looks towards the castle. The picture was taken standing outside Waverley Station. At one time, hundreds of years ago, the low lying area under the bridge was a loch which served to further fortify the garrison on the rock above. While walking through New Town to the Central Edinburgh Youth Hostel from Waverley Station, I came upon two American Indian musicians. I found their music irresistable and stopped to listen. While doing so, I made the following video. What a treat! I felt I was getting a bonus. OLD TOWN In closing this brief account of my visit to Scotland’s capital, here are two photos of the Old Town that I borrowed. 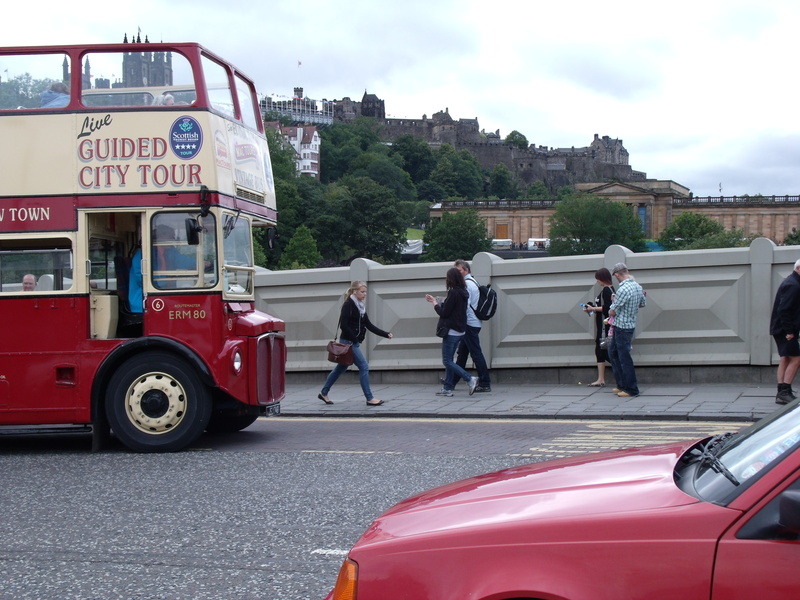 For those who would like more detailed information about the history of Edinburgh, click on the link above for an excellent history site. High Street, more often known as the Royal Mile, has many buildings today that are unchanged since the 17th and 18th centuries, with some dating back to Mediaeval times. It deadends at the castle and stretches just short of a mile to what was once the eastern boundary. Edinburgh was originally a walled city. Click the ‘Visions of Scotland’ link in the sidebar at the top left of this page for more historical data. Thanks for taking the time to comment, Norm. So glad Hamish referred you. Hope you find the main blog with new and improved posts. Always nice to hear someone out there is enjoying my offerings! C.
Thanks, Rick! Glad you like the blog. I just came back from another trip to the Orkneys and have much new material that I’ll process and post as soon as. It takes a while to put it all together but I’m sure you’ll like it when it’s done. Christine.